Administrators of an ArcGIS Online subscription now have the ability to use the organization's print service for printing web maps with their own map layouts. A number of enhancements have been made to make it easier for administrators to manage their organization's ArcGIS Online site. Some of the configuration settings have been reorganized into more focused categories. For example, sharing options are now in the Security section. There is also the ability for administrators to disable comments on items owned by their organizations, and for organizations to register their own print service for their own use. The last set from GeoEye's IKONOS 50 million-square-kilometer high-resolution imagery has been added to the World Imagery Map. The set includes expanded coverage of 1-meter resolution GeoEye IKONOS imagery for parts of Afghanistan, Africa, Australia, India, New Zealand, and South America. Contributions to the World Imagery Map through the Esri Community Maps Program include several regions in Canada and Switzerland. 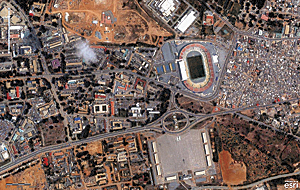 In December 2012, Esri also started adding DigitalGlobe imagery to the World Imagery Map, with 30-centimeter and 60-centimeter imagery from DigitalGlobe's Global Basemap layer being added for the United States and western Europe. More DigitalGlobe detailed imagery for the rest of the world will be added in the coming months. Sign up for a free 30-day trial if your organization doesn't have an ArcGIS Online subscription yet. You can invite up to five named users to participate in the trial, and you get 200 service credits and Esri Maps for Office as part of your trial. When your trial is over, you can purchase a subscription and continue to use all the features and services with the same ArcGIS Online subscription account. Sign up today.